Taiwanese people are, in general, pretty casual, and not nearly as hung up on rigid formalities as folks in Japan (whose myriad unwritten rules of etiquette, such as which party should bow more deeply upon first meeting) are legendary. That said, there are still some pretty fundamental traditions involving customs, taboos and traditions worth knowing in advance, starting with the traditional days of the Lunar New Year holiday. Though traditions surrounding these days aren’t as rigidly observed as they once were, they’re still a pretty good barometer of who’s going to be visiting whom by day. As a casual visitor, knowing this stuff will do more than just demonstrate that you’re a rock star in the cultural sensitivity department: It’s also a pretty decent way to predict a) how bad traffic is going to be on any given day, and b) how likely you are to be taking your meals at a convenience store for want of an open restaurant on any given day. This is the last day of the year of the Rooster, and just like on the western New Year’s calendar New Year’s Eve begins right around sundown and continues until the stroke of midnight, which – don’t worry – unless you’re somewhere up in the mountains (and even then, you’ll have to be pretty far in) you won’t sleep through, as the moment will be marked by a cacophony of fireworks. Tradition dictates the young visiting the old to strengthen family ties. In practical terms, this means that, like yesterday, the roads will be clogged with traveling families going to visit the relatives, but traffic is a bit lighter than yesterday (as a fair chunk of Taiwan will have done their traveling yesterday). It’ll still be tough to get a train ticket, and many stores and most restaurants will be closed. If you happen to be in Taipei, today’s a great day to bicycle around the city or practice your jaywalking; the roads in the capital will never be clearer than on day one of the Chinese New Year holiday. Most Taiwanese folks stay put on the second day and continue feasting and playing Mah-Jong. However, day two is traditionally when married women will return to the homes of their birth parents, so some families will spend the day visiting maternal grandparents. Traffic is generally better on day two outside of the cities, and parts of Taipei may still feel like a daytime scene from the movie I Am Legend. Many stores and restaurants remain closed on day two. The third and fourth days of the Lunar New Year are when lots of people travel from town to town, so your best bet is to explore the city in which you’ve woken up. Lots of people visit temples on these days, so it’s a great time to do the same. Taipei is as uncrowded as you’ll ever find it, so these are the ideal days to explore Taipei. Though some stores and restaurants will still be closed on these days, others will be open for business. Traffic won’t be as bad as on the first and last days of the holiday, but if you’re traveling between cities you’ll want to adapt a zen attitude towards traffic. 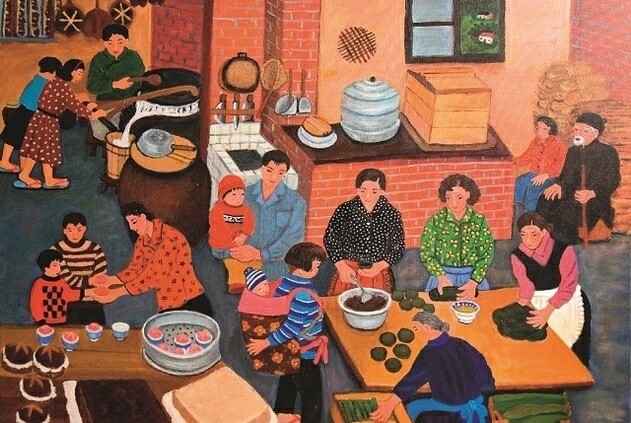 Though festivities will continue until the Lantern Festival on March 2nd, this is the last day of the public holiday, so expect lots of last minute revelry, feasting, last-day settling of debts at the Mahjong table. Most businesses should be open today, and traffic will be heavy as a fair chunk of Taiwan heads back from south to north to get ready for work on Wednesday, February 21. If you’ve been in Taipei roller skating naked down Chung Shan Road for the last few days, cut it out: Mom & Dad (and everyone else) are definitely home again. Perhaps no single item is as associated with Chinese New Year as the red envelope or hóng bǎo. Unlike the closest analogous holiday season to Chinese New Year in the west (December’s Christmas / Hanukkah / Kwanzaa period, or, if you’re not a fan of any of those, Seinfeld’s Festivus holiday) in which gifts between family members are usually store bought (or hand-made) items, in Taiwan the standard gift is money served in a perfumed red envelope. Generally, the traditional hóng bǎo flow is from old to young; youth are the beneficiaries of the seasonal largess, and elders pay the bills. So, nothing all that different here. Though a red envelope with a numerically auspicious amount of money (no odd numbers, avoid the number four, eight is lucky) is an absolutely appropriate gift for you to give on other occasions, as a house guest over Chinese New Year your hosts will notexpect you to present them with money. Their kids – if they have any – may feel differently. Much in the way that western children see any house on Halloween as a source of free candy, Taiwanese kids see adults on Chinese New Year a potential source of red envelopes. If you already know your hosts have kids (and your relationship is close, or you wish to be seen as a truly stand-up sort), preparing a couple of red envelopes with a small amount of cash (NT$600 is generally the right amount for kids) will turn you from visitor to cherished friend for life, at least in the eyes of the kids in question. If there are going to be numerous children, your best bet is to come armed with lots of individually wrapped sweets that you can give out as the situation demands. A general gift for the household will definitely be appreciated by your host family. The list of welcome gifts isn’t all that different than what it would be in the west. A bottle of good wine or liquor will be appreciated in households that indulge. Sweets, fruits and pastries are fairly traditional Chinese New Year gifts that will generally be consumed with great praise with you in earshot. If you’re coming to the party from overseas, some sort of specialty item bought wherever you’ve come is generally a safe bet. Unless the specialty item in question are shoes, clocks or mirrors. Which brings us to the far lengthier topic of what not to bring to a Taiwanese home during Chinese New Year. There are certain items which, for a whole host of reasons, are generally not considered suitable gifts in Taiwan and are in especiallybad taste during the festival season. We’ll stay away from more esoteric items like shoes (seriously, who casually gives shoes as a gift?) and stick to things that the well intentioned but uninformed gift-giver might accidentally bring. * Clocks: A clock symbolizes the inexorable march of time, the end of which is always death. Hence, a clock is a bad gift. (A pity that no one told Texas Governor Greg Abbott this. He presented Taiwan President Tsai Ing-wen with one on a recent state visit. * Mirrors: These are bad for a couple of reasons. First, they’re said to attract malicious spirits. And second, they tend to break into sharp pointy bits, which most cultures consider a bad thing. * Blades: These symbolize the cutting of a relationship, and are thus considered a bad gift. * Umbrellas: The Chinese word for ‘umbrella’ is a bit too close to the word for ‘break up’ (sǎn and sàn, respectively), and thus has negative relationship implications. Anyway, why would you give someone in Taiwan an umbrella, when there’s always a free one waiting in the courtesy umbrella box at any Taipei metro station? Chinese New Year is the most festive period in the year, so in general conversation ought to be kept festive. One custom about which you should definitely be aware concerns fish: A whole fish will almost always be served as part of the dinner feast, as the fish symbolizes abundance and luck. However, tradition dictates that the fish remain unturned for the duration of the meal, as turning the fish is said to portent good luck turning bad (and in some coastal regions, shipwreck). While you’re perfectly free to pick away at the meat beneath the skeleton without turning it (thus demonstrating your superior chopstick skills, never a bad thing) it’s traditional to leave some fish uneaten so as to express your wish that the family’s abundance remains throughout the year. Finally, expect to hear a few phrases throughout your visit. The most common, of course, is xīn nián kuài lè, which means happy new year! If you want to get fancy, you can preface this with zhù nín, as in zhù nín xīn nián kuài lè (“I wish you a happy new year”). Of course, another common phrase you’ll hear a lot of over the season are variations of the word Gongxi, which is a happy sort of congratulations, conveying with two simple syllables wishes for happiness, prosperity and joy. During the days of Chinese New Year, you’ll hear the phrase from dawn until well after dusk through endless repetition of a song that’s basically the Chinese equivalent of every Christmas song wrapped up in one. You’ll also be hearing gōngxǐ fācái. Along with an outstretched hand, the universal gesture for gimme! Which does make sense, since gōngxǐ fācái means “congratulations, prosperity and wealth”, and by saying that to a kid you’re basically encouraging them, as Napoleon Hill might say, to think and grow rich. And what better way to start than by hitting up their new western friend for a gift that, according to custom, they’re kind of entitled to on this, the holiest of high holidays in the Chinese-speaking world? Hope you have another red envelope handy! Or at least some candy.